the day i felt like a drunk frankenstein | you seem nice. the main photos that haven’t been displaying correctly are real annoyin and i don’t know how to fix it. so if this post’s display photo isn’t showing, allow me to include it right hrr. yeah, i know, my friends are way awesome. kelsie sent this my way after learning of the t-section. freakin hilarious/amazing. 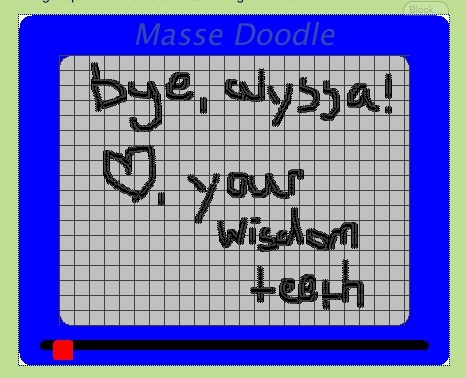 this is also based on my comment of whippin out a magna-doodle after the procedure...which i forgot all about until now. alternative communication fail. ironic? perhaps. so this little hootenanny of a good time was monday (12/12) at 8 in the am. and was like 1.5 hours long. they sedated me with an IV and some magical concoction that made me feel absolutely nothing. after it, everything was fine and dandy and i was moved to another room, and the kind folks at the office told my parents i was in “recovery.” recovery meaning, placing me if front of a giant window that was facing downtown. minor problem: i didn’t have my glasses on. wasted view. they were placed on the window sill staring at me. rude. while i was staring at the fuzzy boxes past the green blurry things, i was trying to figure out how long the extractions took and how long i’d been in the room by myself. i got really confused for some reason and may have panicked a little. then, i realized i didn’t know if my mouth was open or closed because it was numb, so i was trying to make sense of what part was a bottom lib and what part was a chin. it was all sorts of disorienting. 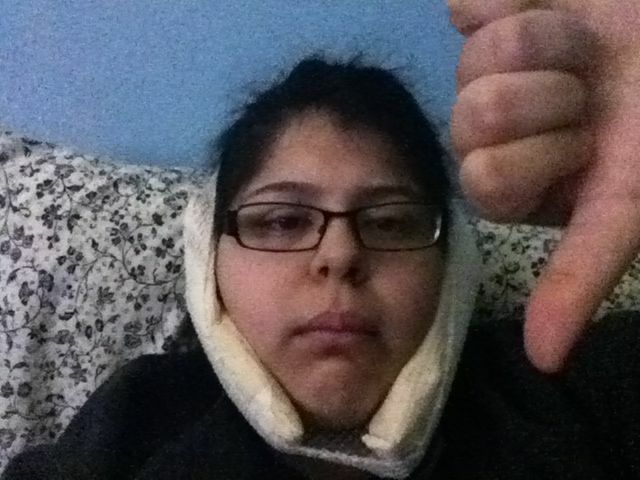 question: what happens when your mouth is numb and stuffed with gauze? as they’re prepping me for leaving, one of the nurses pulls up with a wheelchair. i was like, ‘uhh, i don’t think i need that’ in my mind because i couldn’t figure out how to talk just yet, so i decided to just pacify the nurse and get in the wheelchair because i didn’t want to be THAT patient…ya know, the difficult, crazy mumbling one. i didn’t really understand why they were being so crazy about it until i stood up and realized that i was a little unbalanced. umm too bad i’m totally golden at being off-balanced. on my own. sans wheelchair. on our way through the lobby there were a couple people chillin, and had i been in a better mood, i think i would have waved to them while pretending to be in a parade. but i didn’t and just looked at them with what i was hoping was a blank stare–because I COULDN’T FEEL MY FACE. so with added effects of whatever was in my bloodstream playing tricks on my inner ear, the numbness, and my parents asking me super detailed questions that needed more explanation than just a yes or no (apparently open-ended questions are their forte), i got a little frustrated, so i decided secluding myself to my room was the best option. prior to this photo, i had to check to make sure my mouth was closed. couldn't have other teeth getting any funny ideas. i watched 2 episodes of felicity and passed out. turns out somewhere between me trying to drink water, having it spill all over the floor, catching my mom and dad try to suppress a laugh, and my short-lived felicity marathon, my mom had snuck in a painkiller. my response: YOU SNEAKY MOOOM (go to 3:50). the drugs may cause drowsiness. translation: i involuntarily took a nap. when i woke up though, i was feelin jazzed! see! turns out i was just really cranky. naps fix everything. EVERYTHING. and painkillers. painkillers fix everything, but don't get too attached or you'll end up in an intervention and/or ON intervention. it looks like i was excited about all of it…false advertising. either way, i’m still dosing and dozing it up. if anyone has any recommendations/do’s & don’ts/something they wish they new then please share. 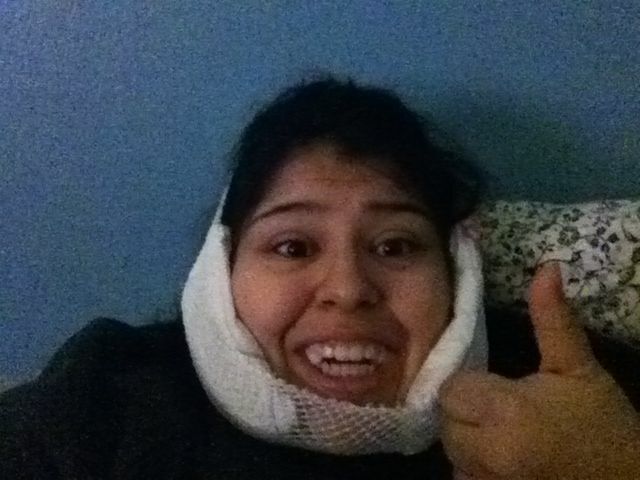 i’ve gotten a lot of friendly encouragement saying that it wouldn’t be so bad and i have to say, it wasn’t that bad. just as long as you take them magic little pills. and my ending note is this: AAAAAAHHHHHHH 11 days til christmas eve and 12 days til christmas day! 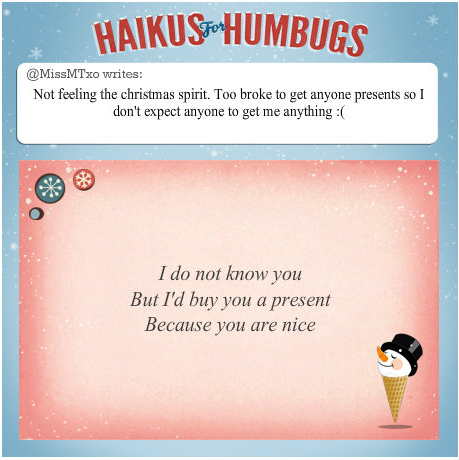 i was perusing tumblr and i found this site: haikus for humbugs. basically, you can tweet someone that was grinch-like or sad or not feelin the christmas spirit at all and cheer em up with a haiku! pretty snazzy. see what i mean? that was really nice of the sender. hopefully everyone is getting ready if you’re not already ready. me: mom, are you almost done shopping? she can’t hear. like at all. but she denies it. so go on you silly cheer spreaders! Ummm….where do you find these websites? I have already cheered up three humbugs…well attempted.